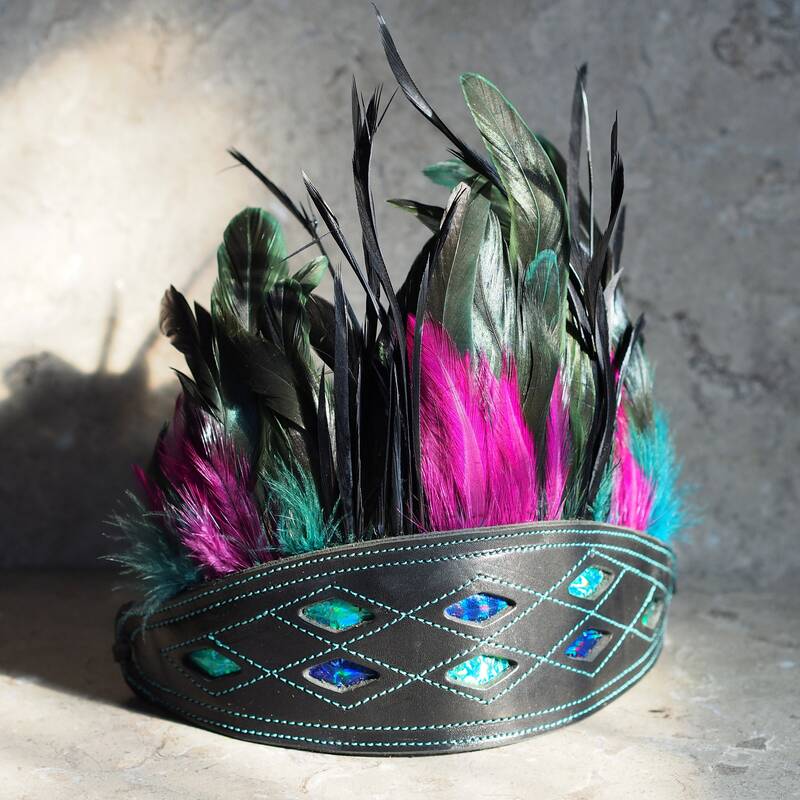 This leather and feather hat band or head band is made with black cowhide with diamond punched holes, which are backed with seafoam green and blue 'holographic' finish italien lambskin--which come alive in the light reflecting back in a prismatic range of colors. 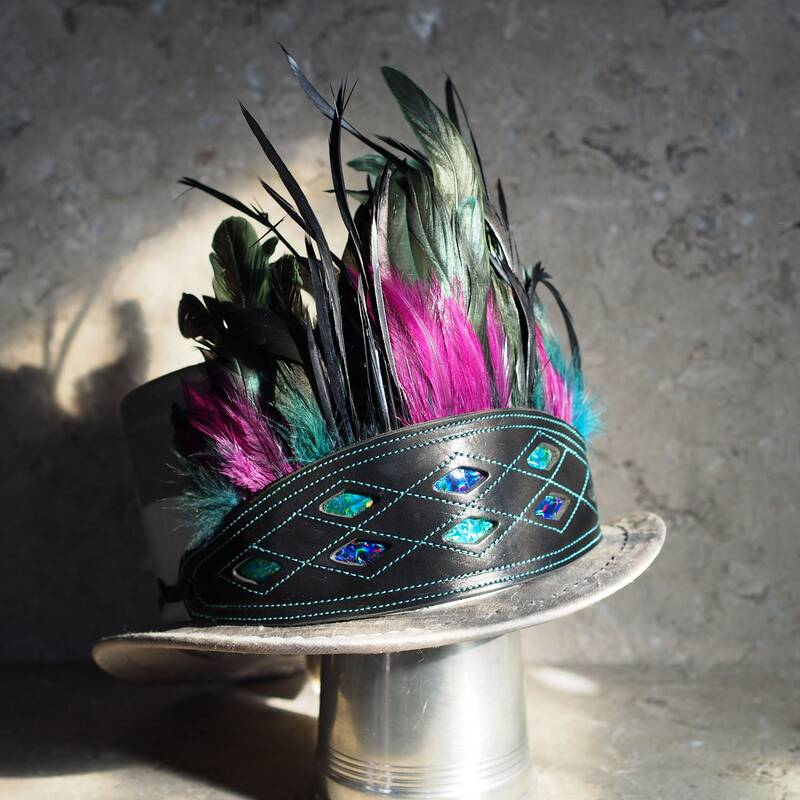 They are accented with teal stitching around the diamond pattern and edge. The leather is 10 1/2" grommet to grommet, and 1 1\8" at ends transitioning to nearly 3" at the center. 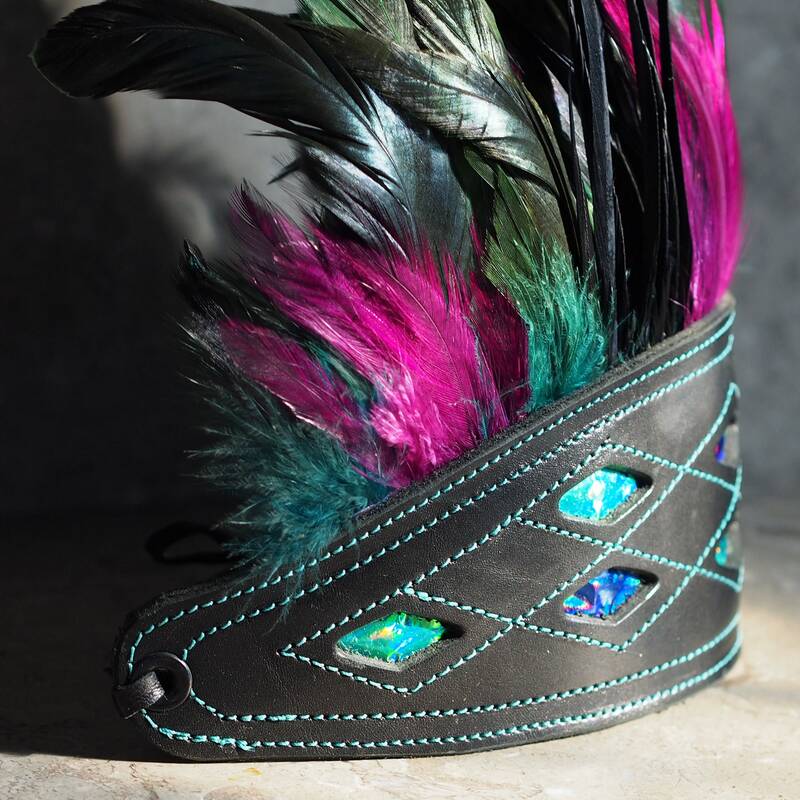 The feathers themselves are mostly 7" above the leather, and up to 10" (if standing straight up). 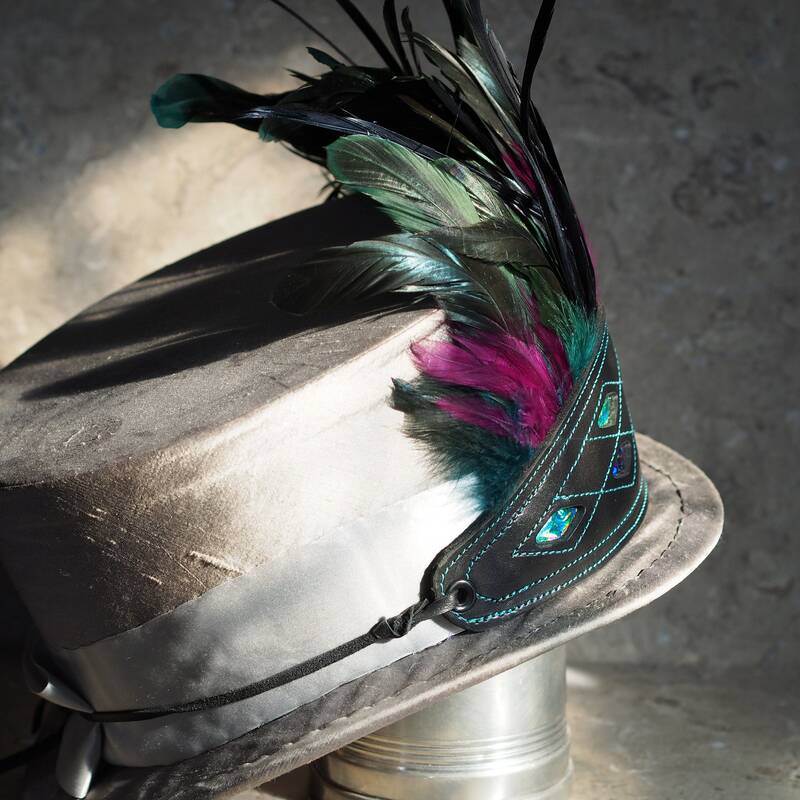 So the taller feathers dance in the breeze and some gracefully bend back over the crown of a shorter hat or your head, or stand up proudly against a taller hat. 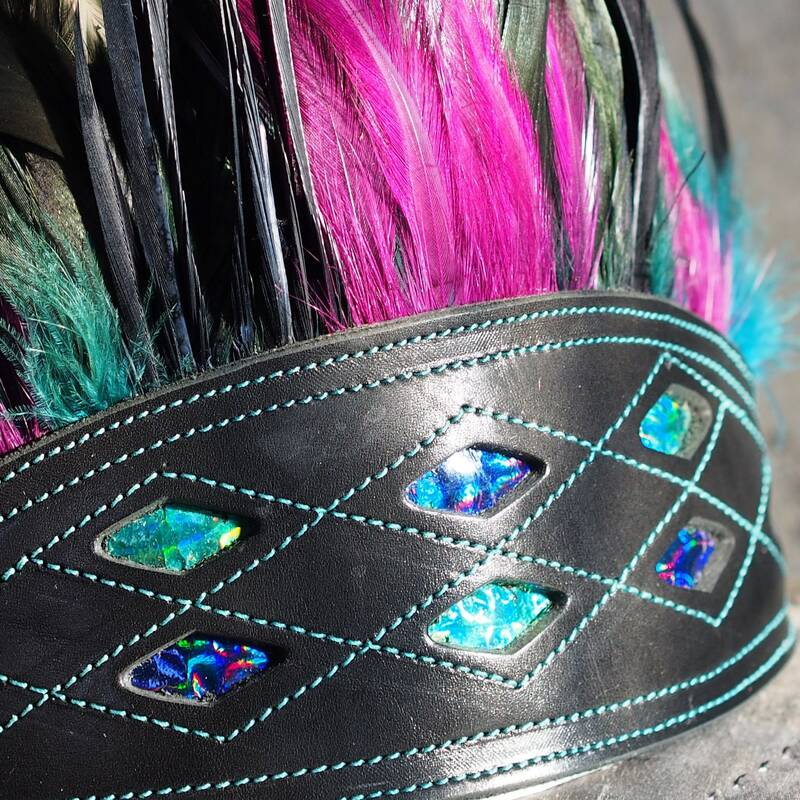 The feathers, all rooster, are mix of colors and types, including black coque tail, magenta and teal & green over black dyed furnace & hackle feathers, and iridescence on the majority that shine with various shades of green in the light, as I tried to capture with the photos taken in natural light. 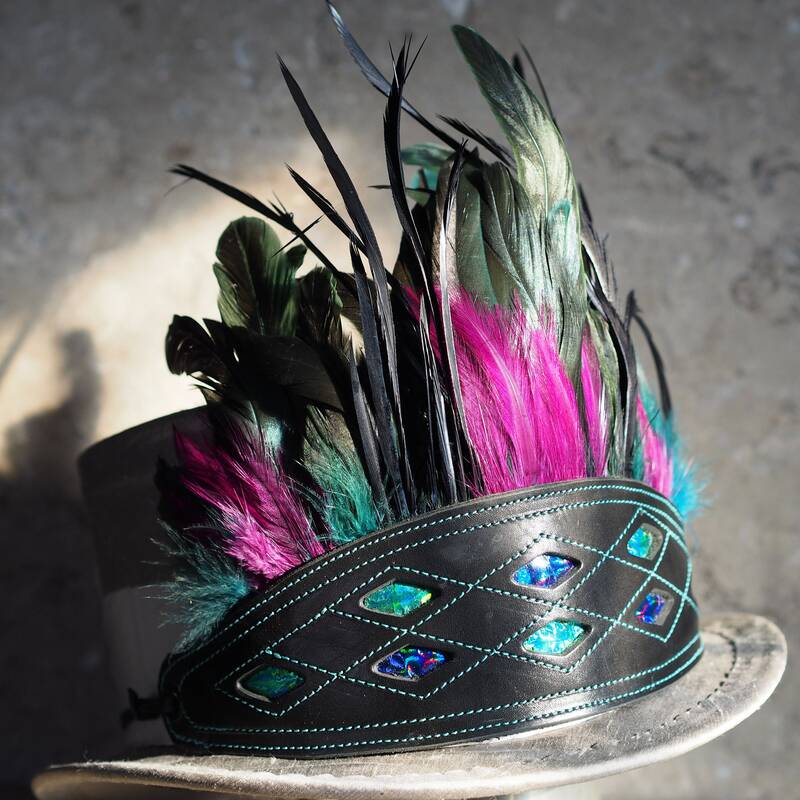 The feathers are sandwiched between the front cowhide and soft black lambskin lining, secured with glue and the two rows of edge stitching. 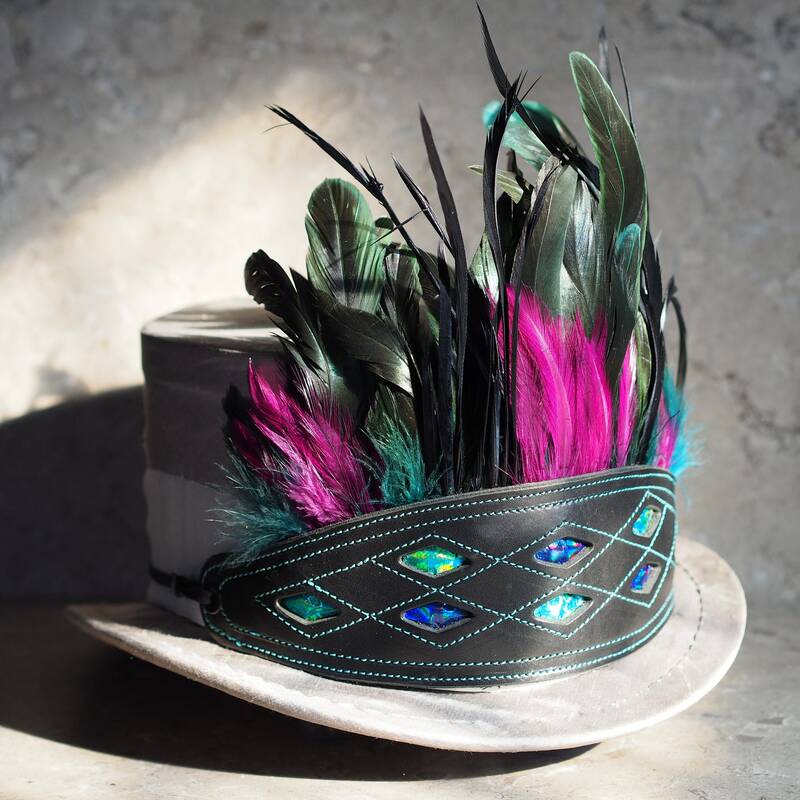 And each feather trim is glued and stitched within ribbon (as purchased) so the feathers cannot fall out. Lambskin ties are included, but these are easy to replace as needed for your fit or function. 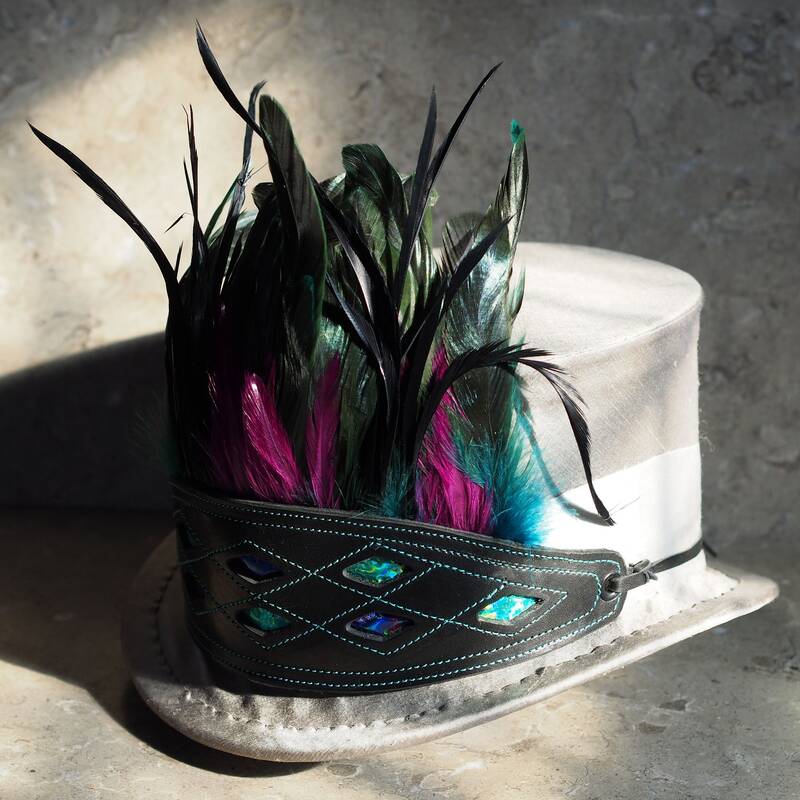 The silver-grey silk top hat shown for reference is 24" circumference on the outer band as shown with the strap. 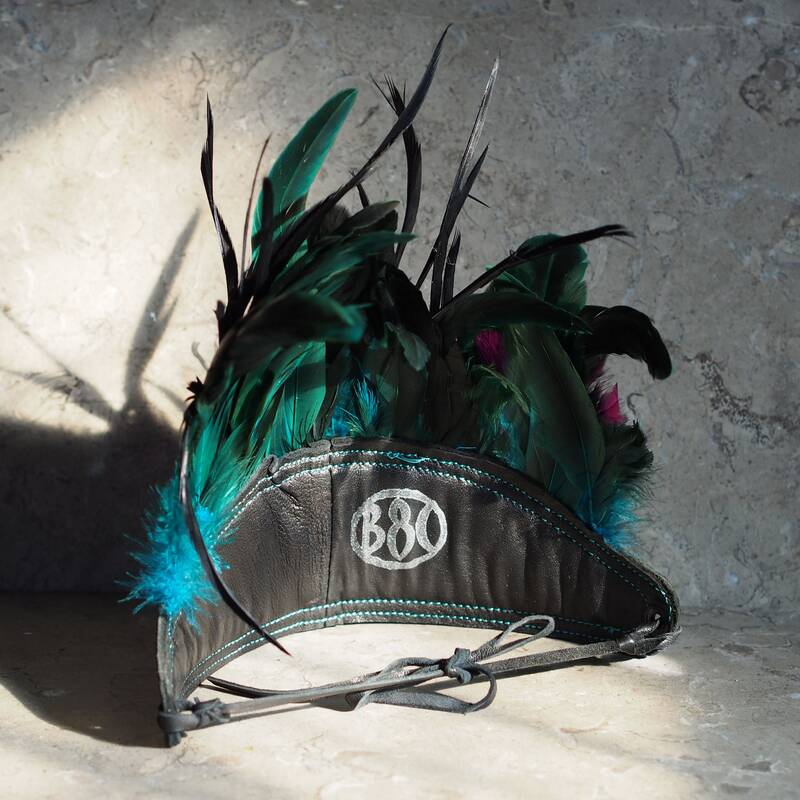 Sorry, this hat is not for sale. 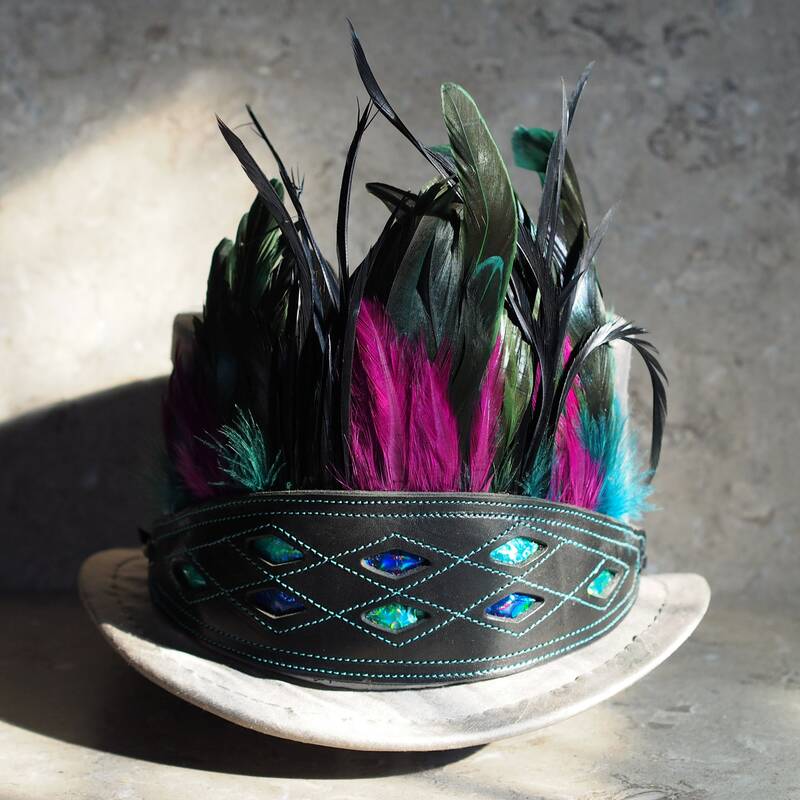 The band will be shipped in a large bubble wrap lined envelop with a firm card to keep the feathers from being bent or crushed in transit.